The time has come. Today we take a look at my favorite shoe of all time, the Air Jordan XI. "The Air Jordan XI was the first athletic shoe to bring patent-leather to the game, resulting in one of the most iconic Air Jordans ever. The XIs also rocked an exposed carbon-fiber plate for added support. If you’ve got a pair of ‘elevens’ break them out today for Day 11 of XX8 Days Of Flight. www.AJXX8.com"
Even though all original colorways have been released, the love for the Air Jordan XI is still as strong (maybe even stronger) as it was when it made it debut eighteen years ago. As stated above, the Air Jordan 11 Retro will return later this year. First up is a new Air Jordan 11 Retro Low in white, black and true red set to release in June. 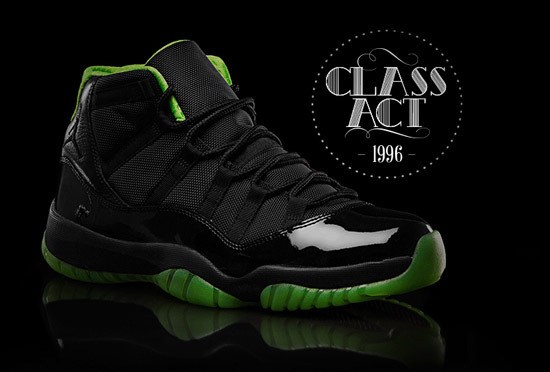 There will be another Air Jordan 11 Retro released during the 2013 holiday season. While many are hoping for the original "Columbia's" to make their highly anticipated return, a new colorway rumored to feature snake skin replacing patent leather in an all new colorway is set to release. There's still hope for the Columbia's so stay tuned for more information as it becomes available. For now, enjoy the images below of this sample black and volt green colorway of the Air Jordan XI made exclusively to celebrate the Jordan XX8 Days Of Flight Collection. Be sure to check out my Twitter @ajordanxi and Instagram @ajordanxi as I have submitted pictures of some of my Air Jordan XI collection to share with everyone. You can also see them on the ajordanxi.com official Facebook page here as well.